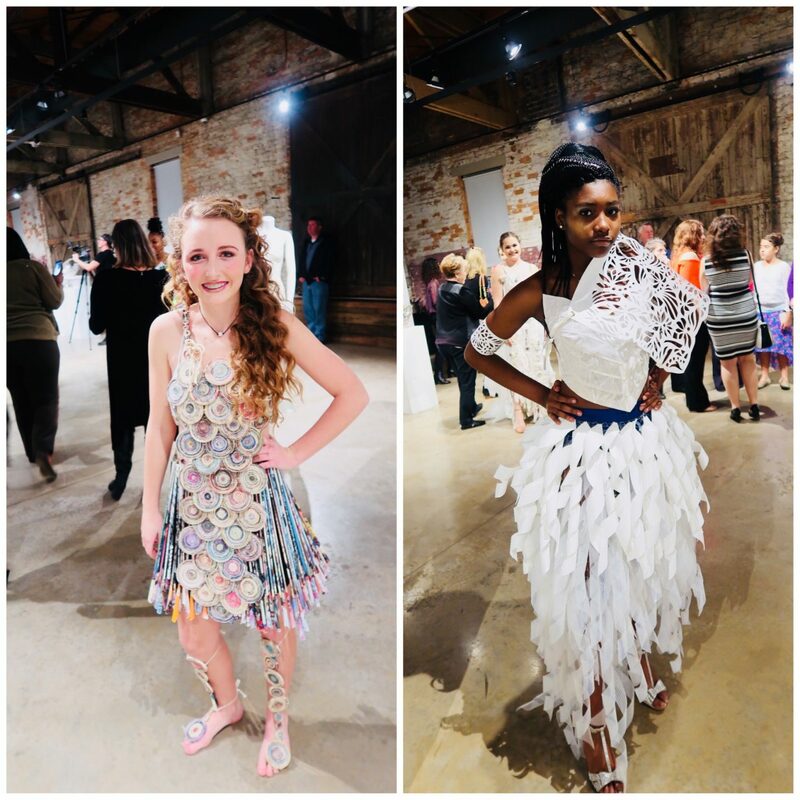 Trashion Show – Shanna C.
When living in a small town, I try to take advantage of every opportunity to get out of the house. This past weekend I took a trip to the Jones-Carter Art Gallery. It was literally a hop, a skip, and a jump down the road. The name of the art exhibit was (Re) Current. 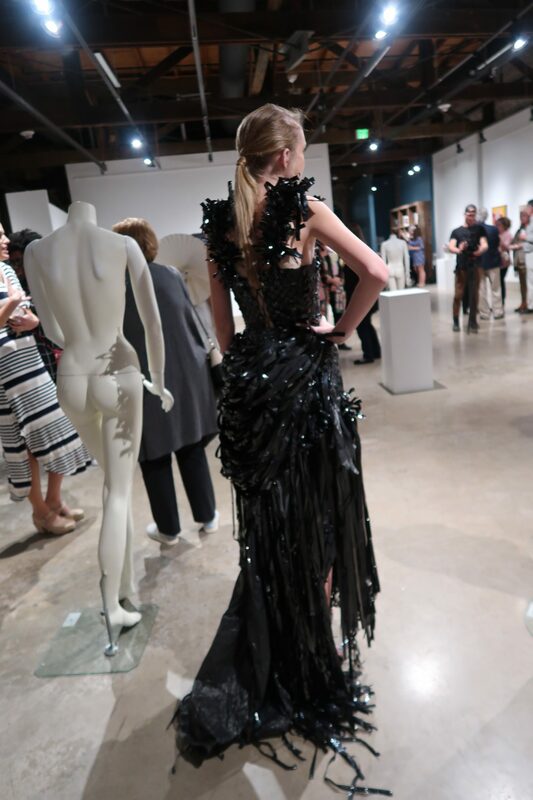 The exhibit consisted of an opening reception and a Trashion Show. 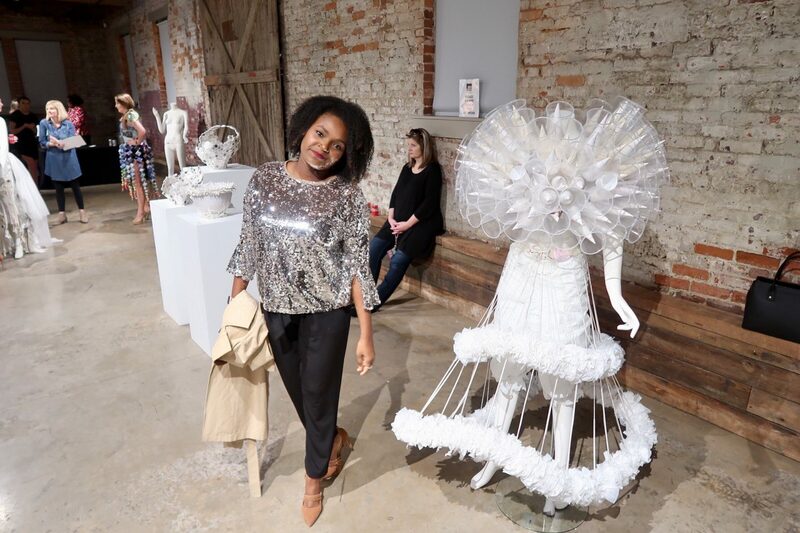 The Trashion show was an ecofab trash couture collaborative. The night consisted of light hors d’oeuvres, mingling, and girl watching LOL. The event started around 8:00pm. When I first walked into the gallery, I was greeted at the door. I journeyed towards the middle of the room and found the food first. Yes, food was the first thing I set my sights on. I grabbed a small plate and neatly placed cheese and sausage dip, pita chips, and strawberries. There were beverages offered, alcoholic and non-alcoholic. If anyone knows me, they know I grabbed a sprite. After grabbing a bite to eat, I mixed and mingled throughout the room. While I continued to mix and mingle, models soon flooded the room. The models were wearing literal trash. Things that you and I usually toss could be found on the shoulders on a slim figure seamlessly sliding through the room. 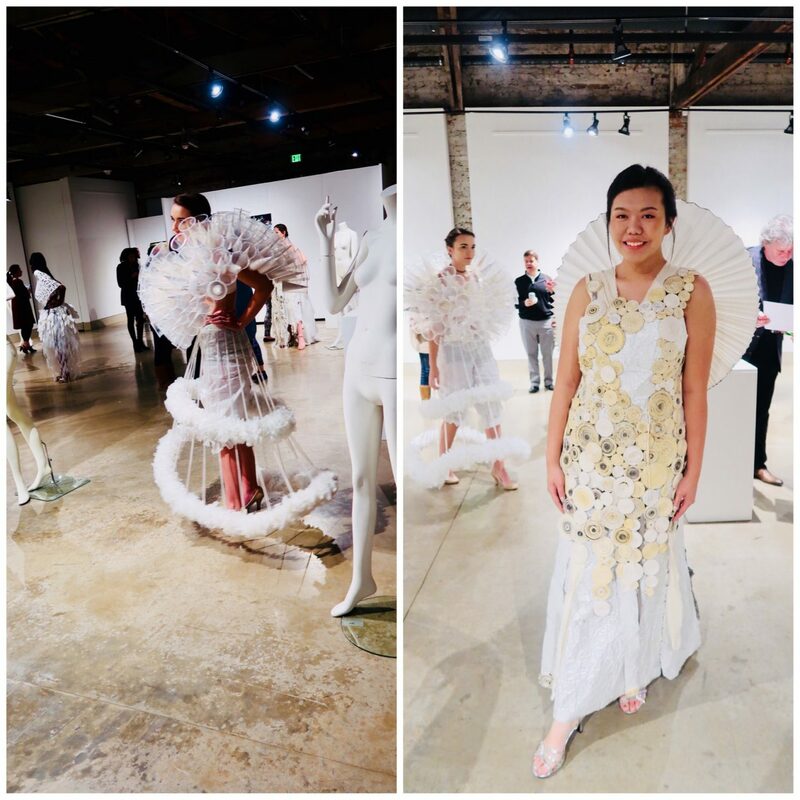 There were many beautiful looks displayed on models throughout the evening. 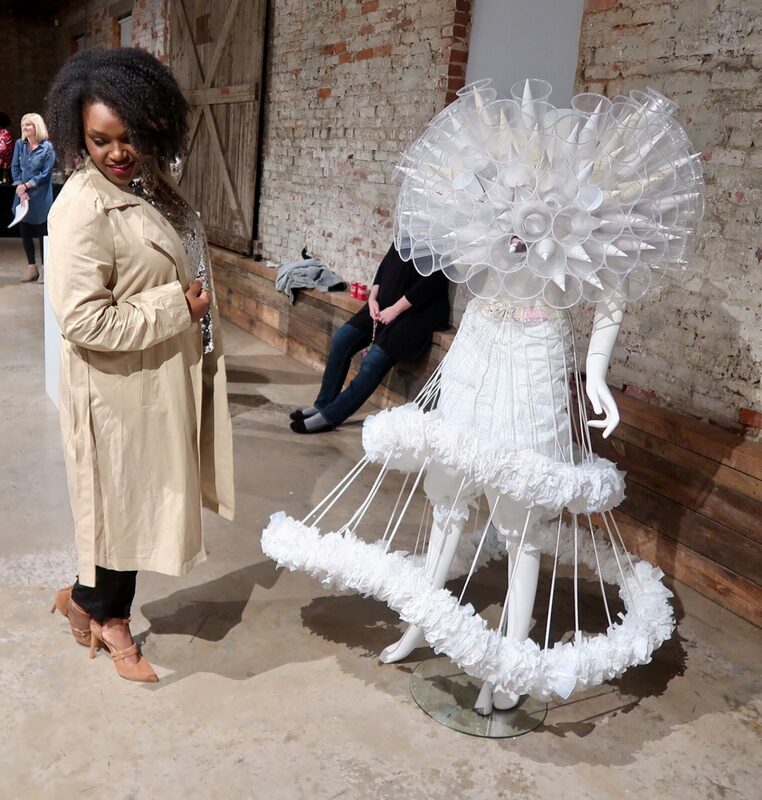 There were dresses made of shower curtains, plastic countertops, VHS tape, and newspaper, etc. My favorite dress was the black VHS tape dress. It was draped and woven like a wicker basket. The one thing about this dress I loved was how it effortlessly flowed. This actually looked like something that could be worn on the red carpet. The fluid femininity of this dress would make anyone woman feel like a starlet. The exhibit will be in town for another month. I think I will go back later to take an in depth look at the beautiful works of art. I can then read up on the artists and the story behind the piece. This will give me a chance to get out of the house. What kinds of things do you do in a small town?